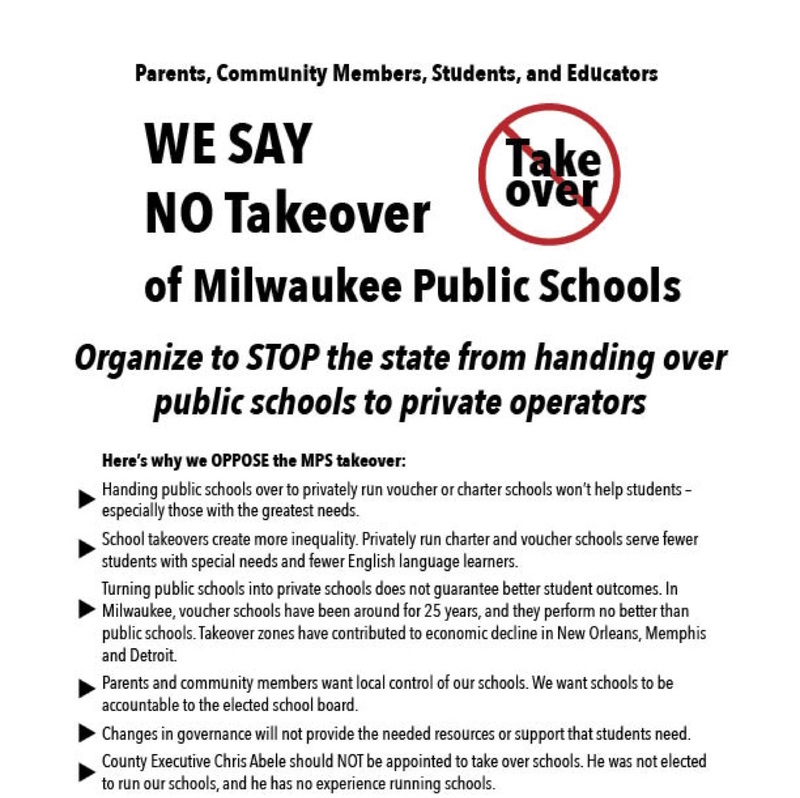 Stop the Takeover of Milwaukee Public Schools! Hands Off Public Education! This coming week is a busy week in the struggle to defend our public schools in Milwaukee and statewide. Join us! JUNE 1: We are calling on everybody who cares about the future of our city to join Youth Empowered in the Struggle (YES) on June 1 at 2 pm for a rally outside their office. From there we will march to nearby schools that could be affected by privatization and show the state government that MPS is ours, and it cannot be taken from us. We Will Defend Our Public Schools! / ¡Defenderémos nuestras escuelas públicas! Join us as we plan our next steps to fight back against the takeover of Milwaukee Public Schools. Parents, Community Members, Students, and Educators are encouraged to attend. We need 1,800 more signatures by next Thursday that we’ll be personally delivering to the co-author of the MPS Takeover, Senator Alberta Darling. We won’t stand silent while Alberta and her minions in Madison legislate the hostile takeover of our elected school board and Milwaukee Public Schools. This Saturday, May 30, Let’s Speak with “One Voice for Oscar’s” Freedom! 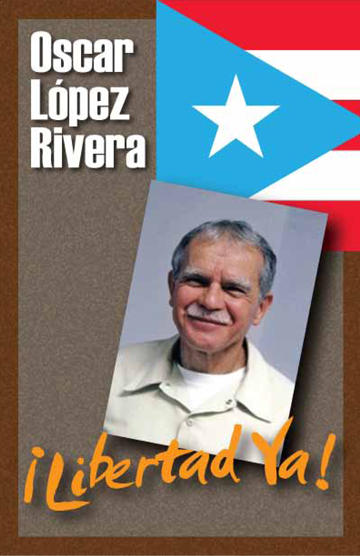 This Saturday, May 30th, over 5 thousand people will gather in New York City for “One Voice for Oscar López,” a national march and rally to demand the release of Puerto Rican activist and icon Oscar López, a 72-year-old decorated Vietnam veteran who begins his 34th year in prison on May 29th despite having never been charged with any violent crime. He has served 12 of those years in complete, total isolation. A broad coalition of over 100 faith, community, labor and civic organizations and elected officials has come together to plan and support this unprecedented mobilization. This support includes: Nobel Prize winners, governors, senators, celebrated artists and people from across the political and religious spectrum. The coalition has already accomplished a great deal, from turning out a huge contingent of supporters at the National Puerto Rican Day Parade—which was dedicated to Oscar’s freedom—to launching a highly successful social and digital media campaign to amplify the calls for his release. But we need your help to take this movement to the next step and to turn out as many people as possible this Saturday, May 30th. From donations to passing out leaflets, from Facebook to phone banking, there are countless ways you can help this grassroots campaign grow powerful enough to bring Oscar home. Over 500,000 people were reached to support Oscar on January 6, 2015, his 72nd birthday, as individuals and organizations from 34 countries and 17 states in the US participated in the “Social Media Campaign for Oscar López.” Using various hashtags, the campaign publicly brought together a broad spectrum of supporters, from Calle 13’s René Pérez to actor Luis Guzmán; from NYC Council Speaker Melissa Mark Viverito to Congress members Nydia Velázquez and Luis Gutiérrez, Governor Aníbal Acevedo Vila; the Puerto Rico Department of Labor; pro-independence organizations to blogs like the Latino Rebels to newspapers including El Nuevo Día. 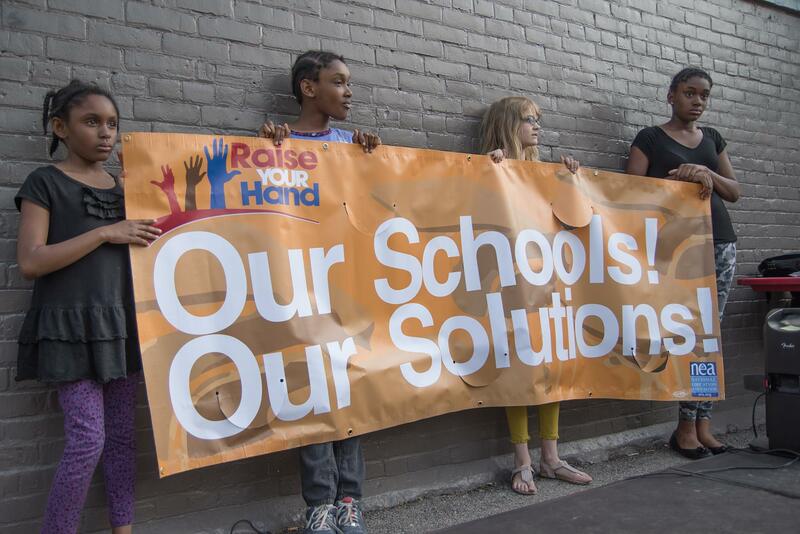 Milwaukee, June 1: We Will Defend Our Public Schools! / ¡Defenderémos nuestras escuelas públicas! We Will Defend Our Public Schools! / ¡Defenderémos nuestras escuelas públicas! On June 1, the Wisconsin legislature is expected to begin its debate on the state budget. Included in this is a proposal, initiated by Sen. Darling and Rep. Kooyenga, for the Milwaukee County Executive to seize control of public schools at whim and sell them to private vouchers. The long term goal of this “Opportunity Schools Partnership Program” is nothing short of the elimination of public education in Milwaukee. This proposal is a blatant attack on the youth of Milwaukee, who will be forced into a school system that is pro-profit, not pro-people. We are calling on everybody who cares about the future of our city to join YES on June 1 at noon for a rally outside our office. From there we will march to nearby schools that could be affected by privatization and show the state government that MPS is ours, and it cannot be taken from us. 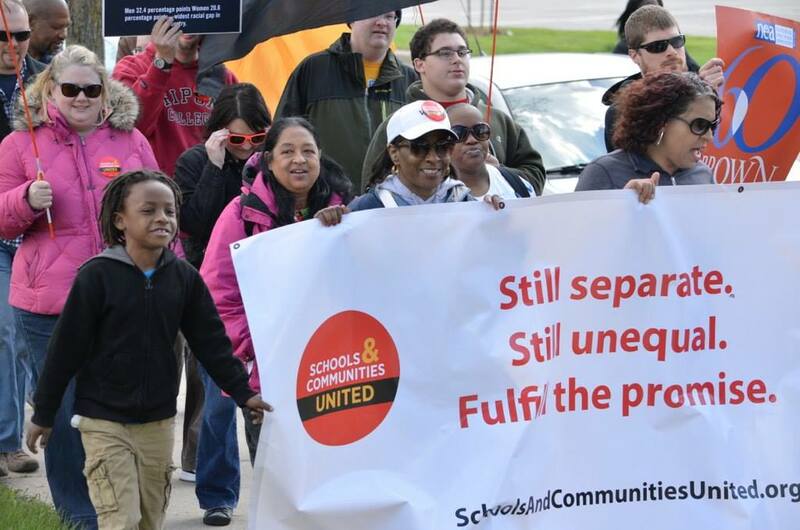 Join teachers, staff and community supporters of public education tonight, May 28, for the Milwaukee Public School Board’s regular meeting, where the budget and the attempted takeover will be discussed. The address is 5225 W. Vliet Street, 6:30 pm. “I’m going to share the call and email information for all of the folks who are on the Board, and I need you to call and email them today and encourage them to stand firm against this takeover of our schools. Even if the state imposes this measure on the Board, it won’t have been without a fight,” says community activist Angela Walker. What is a School Defense Committee? 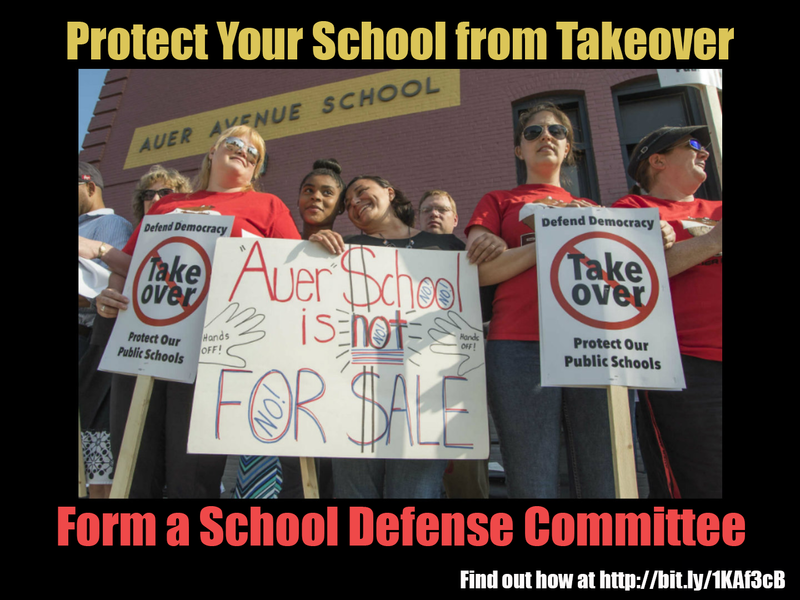 A School Defense Committee is a group of parents, students, educators, community members/organizations, local leaders, faith- and neighborhood-based associations, and businesspeople who are willing to get involved at YOUR school to oppose the MPS takeover plan. Who needs a School Defense Committee? Every school needs one. The takeover plan will identify specific schools to take over, but all schools are at risk because the plan affects the financial health of our whole district. A threat to one school is a threat to all of our schools. 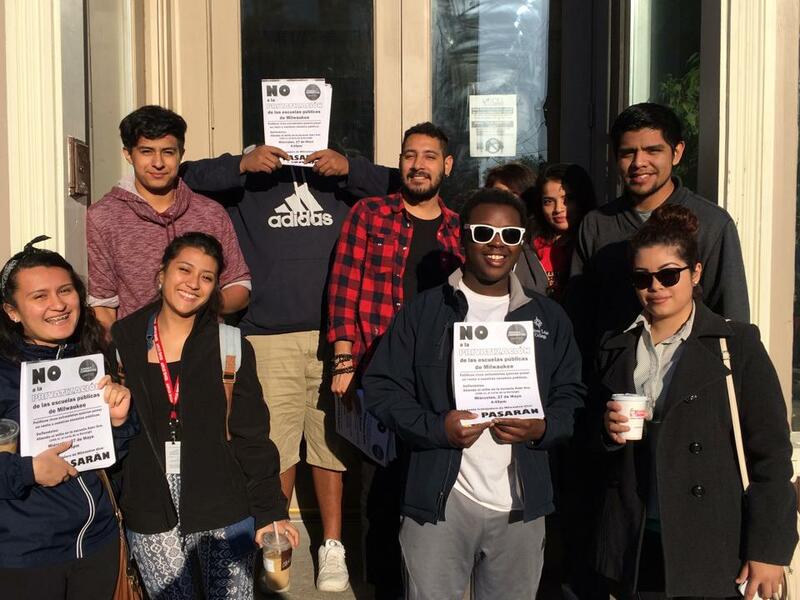 Hold meetings or informational leafleting (before and after school) to inform parents, students, educators and community members about the takeover. Recruit people from your school community to participate in events and actions that support our public schools and oppose the takeover. Speak to the media and legislators about your school. Go door to door in your school neighborhood to build support. Make phone calls to inform and activate others. Coordinate with people at other schools and in other cities (such as Racine and Madison) to show that our state is united for public schools. How can we get a School Defense Committee started at our school? Email Amy Mizialko at amizialko@wi.rr.com. Or fill out the slip below and turn it into one of the organizers at today’s event. MAY 27, 2015, DETROIT – City contractor Homrich’s water shut-off trucks rolled out like thirsty beasts yesterday, targeting Detroit residents who owe more than $150 to the Detroit Water & Sewerage Department (DWSD) and are at least 61 days late on their payments. The wave of shut-offs is the third in recent Detroit history, coming on the heels of shut-offs last year that occasioned huge protest marches, blockades of the Homrich facility, and a visit by two United Nations rapporteurs who condemned the shut-offs. Earlier, in 2002, shut-off trucks also rolled during the Kwame Kilpatrick administration, leading to global coverage of Detroiters’ suffering. 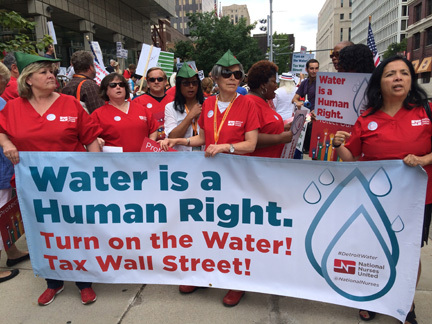 Members of the National Nurses United march in Detroit July 18, 2014.